Tomorrow at first light we head deeper into the forest in search of a troll lord. We have pledged to retrieve an axe in return for safe passage through this forest — which is indeed populated by outlaws, led by a woman, Climber. We were forced to yield our arms to her minions, who led us blindfolded through the forest for half a day until we reached their secret camp. They checked our story and confirmed there is indeed a price on each of our heads. I think that’s the second price on mine and Alix’s. I guess we sounded just about desperate enough to go seek out a troll lord. One good and unexpected thing did happen, though. Climber must have connections, for she brought a cleric of Elloran to speak with us, to apologise for betraying Alix and the others in Tel Elenor a few days ago. They had to make a show in front of the Testerris clerics, it seems. Politics – bah. Anyway, the church of Elloran has compensated us impressively with a resurrection stone and some magic scrolls. We’ve been travelling half a day along a stream when the first attack comes. Six ogres. We deal with them without too much drama. Squirrel or Abra puts one of them to sleep and we tie him up. Maybe he can give us better directions to the troll lord’s lair than those cursed outlaws were able. Before we have a chance to interrogate him, though, we’re attacked again, this time by four wargs. We defeat these too and unexpectedly they fight to the death, rather then fleeing when their cause seems lost. We go back to interrogating the ogre. He’s voluble enough, although I cannot make sense of his words. He tells us the ogres were sent by a power known as the Dark Tree, not the troll lord. And then we’re attacked for the third time in half an hour. Wolverines this time. Five of them. This is getting tedious. And sad. The air reeks with blood. We return to the ogre, and gradually we gain a sort of picture. The power known as the Dark Tree compels creatures and humanoids by leaving ‘signs’ in the forest. It’s also friends with the troll lord and lies roughly in the same direction. Great. As for the troll lord himself, the ogre couldn’t tell us much. Other than if we go there we’ll probably die. As if we couldn’t figure that out for ourselves. Blizzard wants to slit the creature’s throat when we’re done with him, but we let him go. He seems to be free of the Dark Tree’s influence and heads off in search of the ocean. It’s his one last wish before he dies. I hope he’s not being prophetic. It’s pitch dark and Ash wakes me with a soft nose on my face. I hear Alix chatting with Blizzard, and beyond that odd rustling noises. Then their conversation is bitten off and they’re yelling and scrabbling for weapons. Great. I wonder what’s attacking us this time. Three of the creatures flee from the light, but Squirrel isn’t looking so good. Vaantus is yelling something about Blizzard being dragged up a tree. It’s hard to make out what’s going on. It’s all over very quickly. Alix crouches, sadly pronounces Squirrel dead, then tends to Blizzard, who Vaantus has managed to drag out of the tree. All is quiet now. The air is heavy… and once again reeking with blood. We use the resurrection stone on Squirrel and bring him back. True, we’ve only just gained it, but that seems to be the way of things with us. It is better, where we’re going, to have our party complete. We’re standing at the edge of a clearing by the stream, where stands a grassy mound. There’s an ungern — appearance something between an orc and an ogre — trying to fool us into moving into the open. He’s our friend, he says. Yeah, right. Is that why all his brethren hiding over in the trees are being so friendly? The ungerns give up trying to lure us into an ambush. Their charge is sudden and brutal. They have wargs too. In moments Ash and I are surrounded. Completely outflanked. I truly believe I’m about to die. We fight, Ash and I, side by side. The blades sing in my hands. Blood spurts in all directions, but every time one of the enemy goes down, another takes its place. Until suddenly it stops. My blades swing in empty air. I’m a little beaten up, but I’m alive… and surrounded by corpses. I am starting to feel invincible. We take a breather, then investigate the mound, which reveals nothing, other than it’s an ancient burial mound of some kind. We decide to keep moving. Sometime in the afternoon we’re attacked by another charge of wolverines — eight of them this time. We prevail, but all this fighting is taking its toll. We’re weary, not least because of our disrupted night, and in need of some recuperation time. For the rest of the afternoon, we head north instead of south-east, reasoning that if we head away from the location of either the Dark Tree and the troll lord, they might stop attacking us. Hopefully we can find somewhere to hole up for the night, before retracing our steps. Although we will have to be extra vigilant on watch. Eventually I find a single set of humanoid tracks. They are recent, laid down in the last few hours. A little fatalistically, and it must be said curious, we follow them. Towards dusk, we see smoke and the trail leads us through the trees to the ogre we interrogated yesterday. He’s sitting beside a small fire and — clearly surprised to behold us — waves in greeting. He didn’t think to see us here, he says… and invites us to share his fire. We gather around, willing at this point to take whatever comes. He is clearly still free of whatever compulsion caused him and his brethren to attack us, and explains the signs are all to be found south of here. I infer from his conversation that his bravery — in fleeing the Dark Tree’s influence and lighting the fire — is derived from a conviction that he will soon die. I guess it’s too much to hope that conviction is misplaced. Nonetheless, for better or worse, we camp here tonight, in the company of an ogre. Never did I think to see the day. The morrow will bring what it will. First up, let me say that my dice were on fire the other night. Zillah fights with a weapon in each hand, which (along with other feats) give her four attacks per round. She smoked those ungerns and wargs in the big battle, with a number of confirmed critical hits. This session also marked the first time Ash (Zillah’s dog) was unleashed in battle. It’s taken me a while to get up the confidence to risk him being killed… and then it was a matter of remembering to deploy him. But he finally entered the game in style — effectively giving me a fifth attack roll. (All the fun for meeee.) Now I just need to figure out how to use him for tricks. 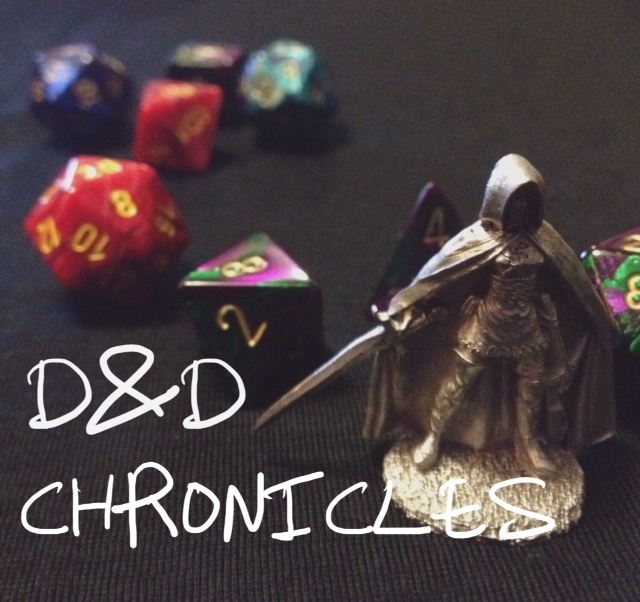 Finally, I’ve set up an archive page for D&D Chronicles. This lists all the characters, past and present, and all the posts with links in order.